David Livingstone (1813-1873) was a Scottish missionary, doctor and explorer who helped open the heart of Africa to missions. His travels covered one-third of the continent, from the Cape to near the Equator, and from the Atlantic to the Indian Ocean. David Livingstone. The Pathfinder of Africa. David Livingstone. Short biography and chronology of events. David Livingstone. Missionary and explorer to Africa. David Livingstone. Scottish missionary and explorer. David Livingstone. Explorer and missionary. David Livingstone, 1813-1873. Short biography. David Livingstone, to Africa With Compass and Bible. Short biography. David Livingstone, Missionary Explorer. Short biography. David Livingstone: Finding a Wife on the Field. David Livingstone: Estimate of His Lifework. David Livingstone. Short biography for young people. Pioneer Missionaries: David Livingstone. Short biography for young people. Missionary Heroes: David Livingstone. For boys and girls. eBooks by or about David Livingstone. Mary Moffat Livingstone (1820-1862) was born at Griquatown, Africa, to her missionary parents, Robert and Mary Moffat. She married David Livingstone in 1845, and "exchanged one great name for another," and honored both. The years that followed were difficult for her as they moved about often and she was ill much of the time. They had six children: Robert, Agnes, Thomas, Elizabeth, William, and Anna. Mary was afflicted more than once with partial paralysis, and one time she and the children returned to England for four years in order for her to recover. Her death in 1862 was a great loss to her husband who continued his missionary work for eleven more years. 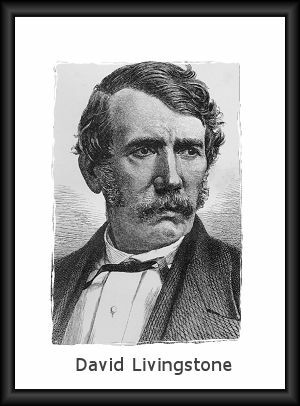 David Livingstone: African Explorer by John Hudson Tiner. ©1997. Biography of an explorer, missionary, scientist and doctor. His exciting exploits in Africa tell a story of unsurpassed courage and determination. David Livingstone: The Truth Behind the Legend by Rob Mackenzie. Published by Christian Focus, 2003. First published 1993. Dr. David Livingstone: Missionary Explorer to Africa. DVD. Gary Wilkinson Productions, 2013. Distributed by Vision Video, Worcester, PA.
See more recommended Missionary biographies.